"Jarhead" (the self-imposed moniker of the Marines) follows "Swoff" (Gyllenhaal), a third-generation enlistee, from a sobering stint in boot camp to active duty, sporting a sniper's rifle and a hundred-pound ruck on his back through Middle East deserts with no cover from intolerable heat or from Iraqi soldiers, always potentially just over the next horizon. Swoff and his fellow Marines sustain themselves with sardonic humanity and wicked comedy on blazing desert fields in a country they don't understand against an enemy they can't see for a cause they don't fully fathom. Foxx portrays Sergeant Sykes, a Marine lifer who heads up Swofford's scout/sniper platoon, while Sarsgaard is Swoff's friend and mentor, Troy, a die-hard member of STA-their elite Marine Unit. 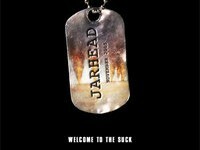 An irreverent and true account of a war that was antiseptically packaged a decade ago, "Jarhead" is laced with dark wit, honest inquisition and episodes that are at once surreal and poignant, tragic and absurd.